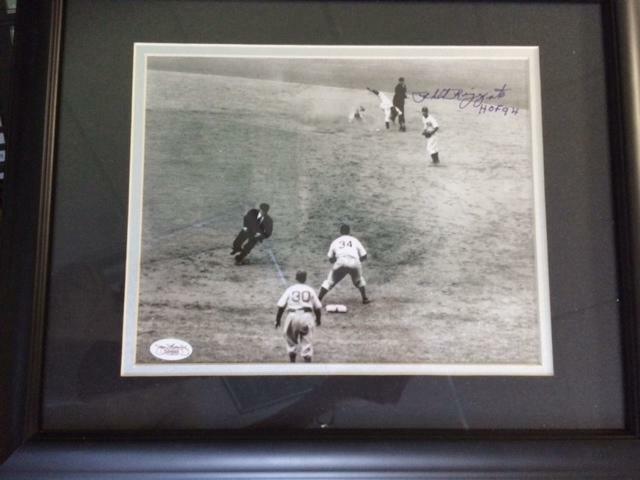 This framed print is signed by one of the New York Yankees legendary players and broadcaster, Phil "Scooter" Rizzuto. 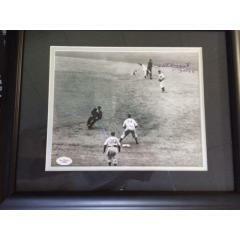 Rizzuto inscribed the print, which is authenticated by James Spence Authentication, with "HOF 94." Due to his popularity and longevity this piece of Rizzuto memorabilia is something every Yankees fan would love to have for their own. Rizzuto spent his entire baseball career (1941-1956) with the New York Yankees, and was a key contributor to the Yankees dynasty, which included ten American League titles and seven World Championships in his 13 seasons. Holding many World Series records for shortstops, Rizzuto was the American League's MVP in 1950. Rizzuto continued his career with the Yankees after 1956, broadcasting Yankee games on radio and television, and entertaining Yankees fans for the next 40 years. His popular catchphrase was "Holy Cow!" The Yankees retired Rizzuto's number 10 in a ceremony at Yankee Stadium on August 4, 1985, and he was elected into the National Baseball Hall of Fame in 1994.